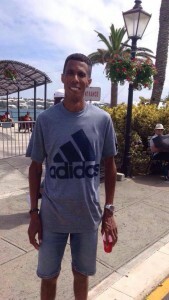 Jay Donawa wins the Appleby Bermuda Day Half Marathon after many years of competing. The 44-year-old athlete says he has lost count on the number of Bermuda Day races he has competed in, but yesterday’s race was his last. Before the race yesterday, Donawa had good intentions on finishing in his well deserved first place but remained alerted of endeavors an athlete may face while competing. “I went into the race optimistically cautious,” says Donawa. As a dedicated athlete who preaches that one should never give up in life, Donawa strived for his success yesterday through continuous training. Many long-time supporters of Donawa exclaimed that “this is his -Donawa- day” and Donawa was congratulated throughout the Bermuda Day parade where he spent the rest of his day with his son. The now retired athlete was not focused on time for the race, crossing the finish line at 1:20:08. Donawa was more focused on running his own race and keeping a good pace that will put him on top. Shades of Pete Sampras, John Elway and Peyton Manning there. Win the ‘big one’ then go out on top. What a well-earned success after so many years of putting in the training and hard work. Enjoy the achievement. Well done Jay! Your perseverance has paid off!!! A well deserved win! Jay you are an inspiration to me and should be to many youth on this island. Never give up!! Congrats Jay you will always be my # 1 runner. Can’t explain how i felt when you came across front street.